You can use a project to work with source control. You can perform operations such as update, commit, merge changes, and view revision history directly from the project environment. Git™— See Set Up Git Source Control. Subversion® (SVN) — See Set Up SVN Source Control. Software Development Kit (SDK) — You can use the SDK to integrate projects with third-party source control tools. See Write a Source Control Integration with the SDK. Add source control to a project. See Add a Project to Source Control. Retrieve files from an existing repository and create a new project. See Clone Git Repository or Check Out SVN Repository. Create a new project in a folder already under source control and click Detect. See Create a New Project From a Folder. Make your project publicly available on GitHub®. See Share Project on GitHub. Before using source control, you must register model files with your source control tools to avoid corrupting models. 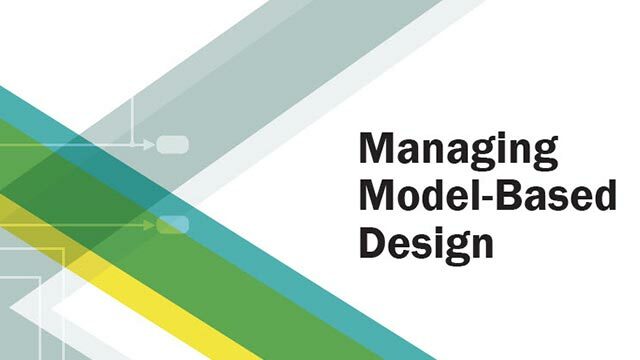 See Register Model Files with Source Control Tools. To view an example project under source control, see Explore Project Tools with the Airframe Project. 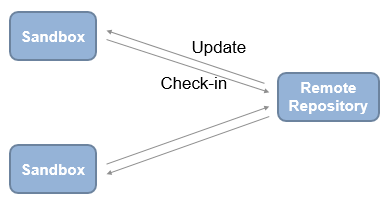 This diagram represents the classic source control workflow (for example, using SVN). This diagram represents the distributed source control workflow (for example, using Git). To choose classic or distributed source control, consider these tips. You are new to source control. You need to work offline, commit regularly, and need access to the full repository history. 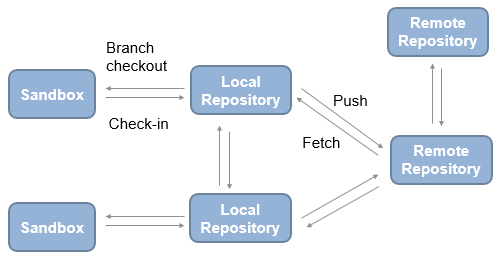 You need to branch locally.